This weekend I ran my first long run in quite a while. (I’m not sure there’s any logic behind this thinking, but I’ve always considered 6 miles the distance that I can call a weekend run a long run.) I was shooting for 6 miles, but forgot to start my watch, and ended up going about 10k. I didn’t mind the extra bit of running, and really the whole run felt terrific. I haven’t had a great weekend run in a while, and I really wanted this one to be a win, so I decided to run/walk it. I needed my legs to feel less brick like, and run/walk always works for that (for me). For the first 3 miles I ran for one song (~3 min) then walked a minute, then for the next 2 miles I ran for two songs (~6.5 min) then walked a minute, and for the last 1+ mile I ran the whole time. The running sections felt fast and easy, and I ended up with an average 10:30 min/mile. I would have preferred to run closer to 10 min/mile, but this is not bad for me, especially for run/walk. I like lengthening the running sections as I get further into the run. It usually results in a quicker second half, which always makes me feel awesome. In other news, my right calf has been giving me some trouble on and off by being tight and sore. I wore compression socks all day long last Thursday and Friday, and after my long run on Saturday, and now it feels fine. Compression Socks for the win! I’m not sure whether running in compression socks has ever done anything for me, but I’ll take this as proof that they help for recovery. I have 3 pairs now, quite the little collection, and all different brands. I’m thinking of writing a little review/comparison soon. Get excited! Do you ever run/walk? What distance makes a long run? 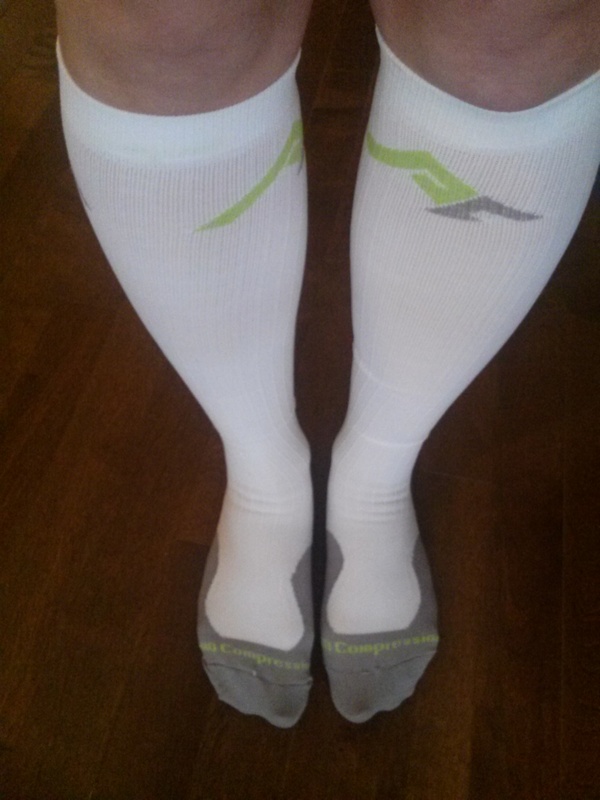 Compression socks: yay or nay? I still haven’t tried compression socks, but I’ve been wanting to. My calves are usually pretty tight after a long run, and I’m curious to see if they help with that. I’ve had a pair for about a year, and while I think they feel good after a run, I have definitely doubted whether they actually do anything. Until last week. Now, I’m sold on their usefulness. I’m still not sure the price is worth it though…I recommend sales or scoring a pair for your birthday! I am impressed by your stretching routine. I’m getting better at it, but I still have a long way to go in terms of consistency. I’m sure it helps with preventing sore muscles. I’ve heard walk breaks help prevent soreness, too, so you’re two for two! I’ve never set out intending to run/walk, but I usually end up doing it, usually if something starts hurting and I need a break for a few minutes to recover. The races I’ve ran/walked have always seen me with faster finishing times than the ones I just run… I’m assuming since the walk breaks allow me to go faster after I recover, so I don’t have to stay slow just to keep running. I’ve run in compression sleeves (calf) before and really felt a difference during recovery after the run (I kept the sleeves on). I have a pair of socks but haven’t run in them yet… I’m curious to see if they’re any different. I always find that when I plan walk breaks from the start, I’m able to run a more consistent overall pace, which goes a long way in keeping my morale up. I do however feel ridiculous on that first walk break when I’m not even out of sight of my house yet. Major YAY on compression socks/sleeves. I don’t go for a run without them at this point and I do wear them for recovery sometimes as well! Right now my long run is 8 miles as I have been adding mileage back in after my marathon, but typically when I’m not in training mode it’s 10-12. Do you wear them in the summer, too? I’ve been trying to wear them more on the run as well as for recovery, but now that it’s heating up, I’m not sure I’ll keep that up.